Who better to lead you through our parks than California State Parks professionals? Three backpacking trips will be offered in summer 2019. The trips range from one to three nights, offering options for every experience level. 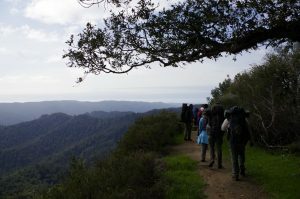 Hike spectacular ridgelines, old growth redwood forests, to sandy shores with our knowledgeable team of backcountry naturalists. Native plant teas, trail desserts, skills demonstrations, campfire stories and jokes are added bonuses. $300; Thursday, Aug. 15 through Sunday Aug. 18, 2019 — JUST ADDED!! This truly unique program is the only such program led by California State Park staff. Participation is open to adults 18 or over and children ages 13 to 17 accompanied by a parent or guardian. Each trip is limited to 10 people. There is a suggested packing list and two forms to fill out. Registration opens at 9 a.m. Friday, Feb. 1. Learn more online, email or call (831) 291-8273. Events made possible by California State Parks, Friends of Santa Cruz State Parks, Waddell Creek Association, Mountain Parks Foundation, Sempervirens Fund, and Portola and Castle Rock Foundation.